The penny farthing or high wheel, high wheeler or ordinary is a cycle with a large front wheel and small rear wheel. This term Penny Farthing comes from the British penny (1d) and Farthing (1/4d) coins of the early and mid-20 century. Although during this period, they were dominant. Not only were they magnificent things to see ridden, but they were also fast and dangerous. With the exception of the railways, there was nothing faster on the roads. There has been a bit of revolution in the Penny Farthing racing scene over the last few years with the Evendale event in Australia and world championships since 1986. Europe now has its own championship races held in Belgium every year and the UK has had the Pennies in the Park races since 2012. Eugène Meyer of Paris, France is now regarded as the father of the high bicycle by the International Cycling History Conference in place of James Starley. Meyer patented a wire-spoke tension wheel with individually adjustable spokes in 1869. They were called “spider” wheels in Britain when introduced there. Meyer produced a classic high bicycle design during the 1880s. 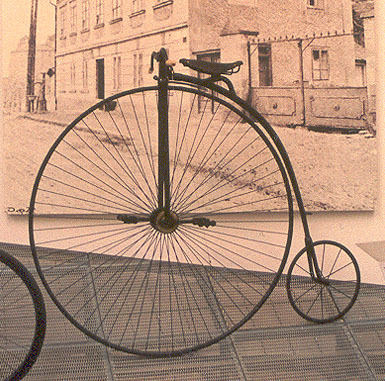 Penny-farthing bicycles are dangerous due to the risk of headers (taking a fall over the handlebars head-first). 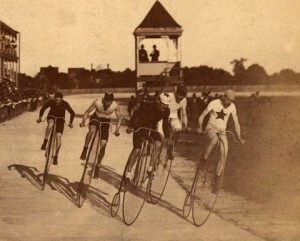 Makers developed “moustache” handlebars, allowing the rider’s knees to clear them, “Whatton” handlebars that wrapped around behind the legs, and ultimately (though too late, after development of the safety bicycle), the American “Eagle” and “Star” bicycles, whose large and small wheels were reversed. This prevented headers, but left the danger of being thrown backwards when riding uphill. Other attempts included moving the seat rearward and driving the wheel by levers or treadles, as in the “Xtraordinary” and “Facile”, or gears, by chain as in the “Kangaroo” or at the hub, as in the “Crypto”; another option was to move the seat well back, as in the “Rational”.